Wednesday’s snowstorm looked to be just another quick hit and run type of storm, dropping maybe 4-8 inches and scooting out very quickly. By late Tuesday night and into Wednesday morning, things began to change very suddenly, model runs coming in at midnight slowed the storm system down, changed the track and cranked forecast snow totals through the roof! 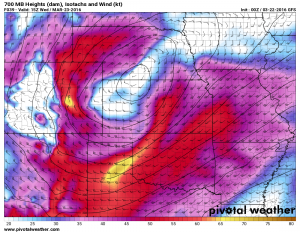 Today I have a look at how this storm evolved, how it played out once it got over Colorado and how it fooled even the most experienced meteorologists up until the last few hours. 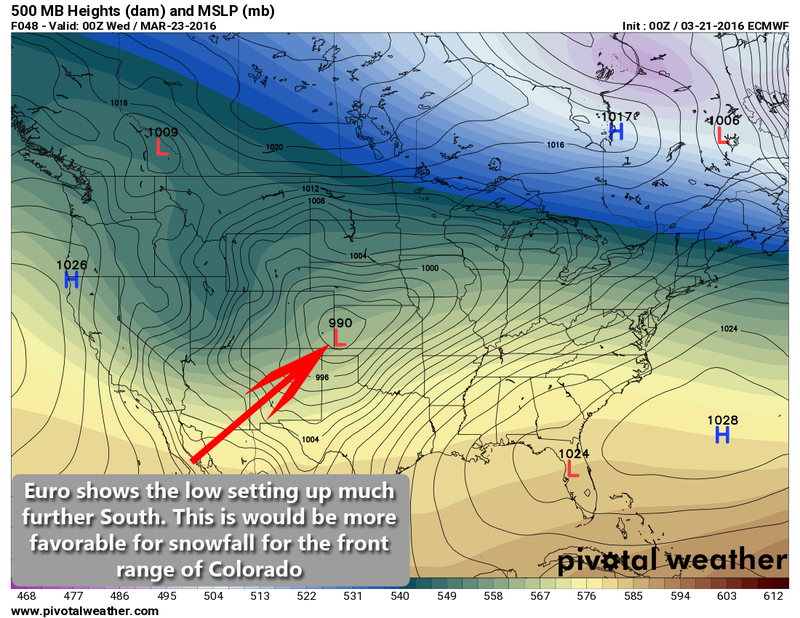 I’ve provided a couple of maps detailing specifics with snowfall accumulation. Keep in mind, the drifting and blowing snow can leave drifts over 2-3 feet, these numbers do not reflect things like that because they are not accurate measurements. For instance, if I go in my backyard and measure the biggest drift, I would see 30 inches of snow, but a drift is just where snow has piled up from the wind. The NWS has a specific protocol for measuring actual snowfall amounts that does not include drifting, when I use this I got 16.8 inches of snow total. This storm through a lot of folks for a loop, even experienced meteorologists had a tough time forecasting this. 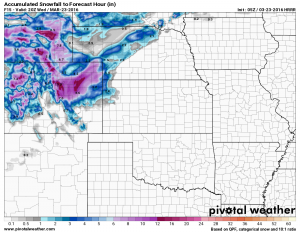 March snowstorms are notoriously some of the most difficult weather systems to forecast for Colorado, mainly because of their unpredictability. 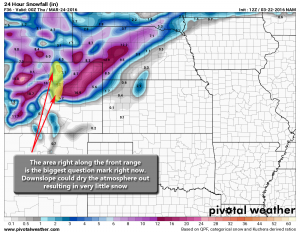 There are a ton of factors that go into making a big snow storm like this and the ingredients have to align just right otherwise we get nothing. As I go through how this storm evolved, keep an eye out. 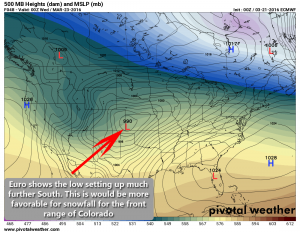 There are little details that this could become a major storm that nearly every meteorologist missed in Colorado (msyself included.) I’ll put these little clues in blue text. 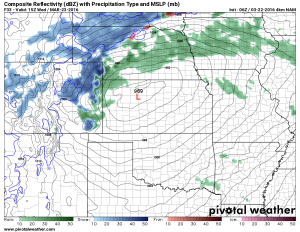 Many of the models accurately tracked the system moving over the mountains, getting shredded up a bit but then re-organizing somewhere over Eastern Colorado. 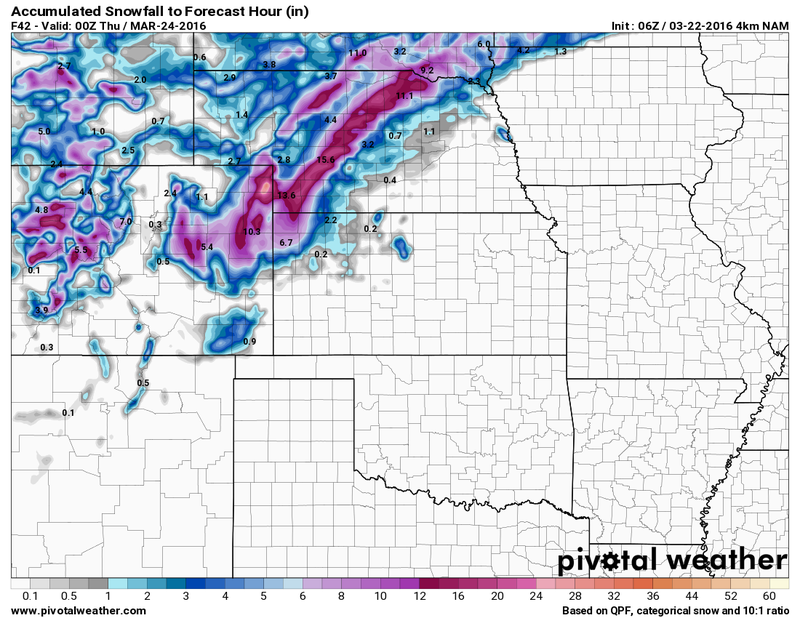 Nearly all of these models predicted the Low to reorganize in Eastern Colorado or Northwest Kansas. Basically, this storm had potential to bring us good snow, but the models indicated it would re-strengthen and move quickly off to the East. The Euro showed the storm system setting up in a much more favorable position and with much lower speed. This model had been telling us this for nearly 3 days…wow. 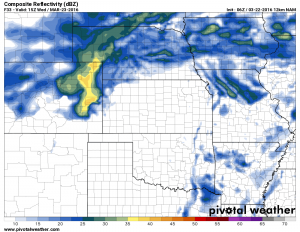 The afternoon model runs showed us more of the same. 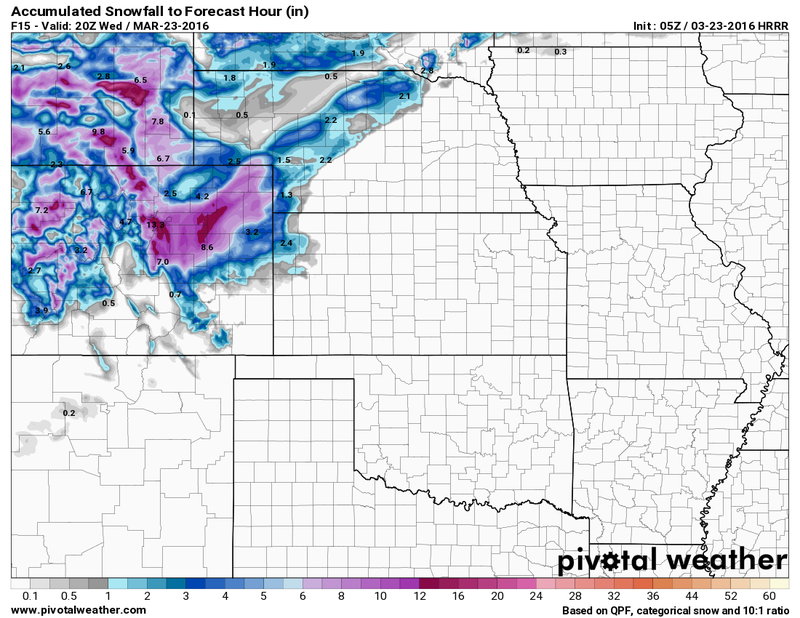 Snowfall totals stayed right in the 4-8 inch range but many showed a pronounced dry slot over the front range foothills. This is a clear signal for downslope flow, which dries out the atmosphere and can erode snowfall quickly. I think these model runs were the main reason many of us didn’t pull the trigger and up snowfall totals, there were serious questions about who got how much snow. 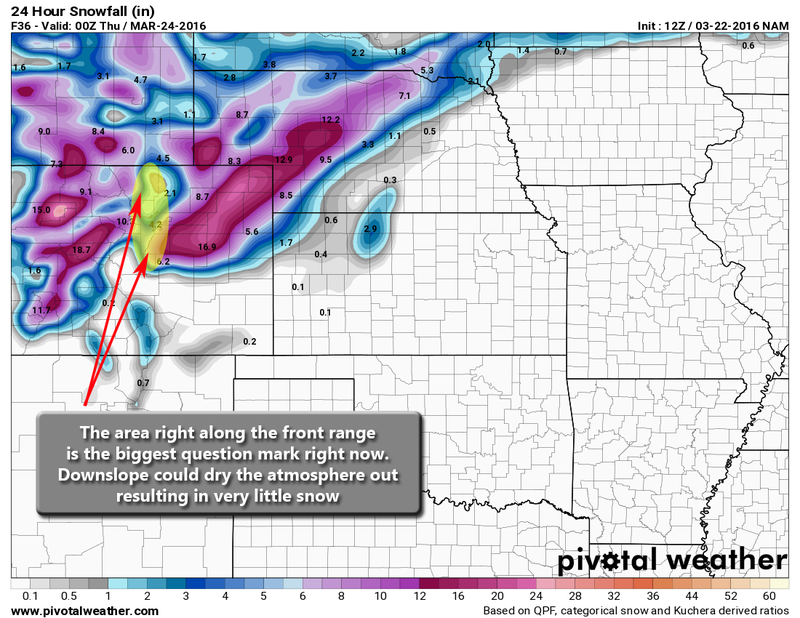 We knew because of the modeling that some areas were going to get dumped on, but Denver and the front range foothills didn’t look to be the place. As of Tuesday afternoon, the high impact areas were the Palmer Divide (mainly East of Castle Rock) and Northeastern Colorado. We had the areas along the front range as a big yellow question mark, the potential for a big storm was definitely. Based on the data we saw at the time though, it was still 50/50. 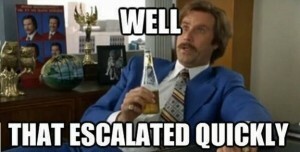 This is when we began to get the first inkling that something big was about to happen. I posted an updated around 1AM with news that every model run across the board had shifted the positioning of the storm and thus cranked up total snowfall quite significantly. I am very hesitant to jump on board the Blizzard bandwagon based on one model run, but in this case it was such a resounding jump by nearly every single model. That plus, the Euro had been picking up on this for days, all the other models had been jumping up and down but were now migrating towards the solution the Euro had been telling us for days now. Initially I had forecast 4-8 inches, I now jumped my forecast to 6-12 inches based on modeling data and looking at observations and possible dynamics. The models cranked up snowfall, but in the end were still short at this time, as was I with snowfall predictions. At this point we knew we were in for a doozy, consecutive model runs had pumped up snowfall accumulation. What caught everyone off guard though I think was, if you left to go to the office early Wednesday morning the roads were not that bad. Many of us had mentioned it may be worth staying home or delaying your commute because the heaviest stuff, based on modeling would not fall until 6AM-12PM. This caused a lot of people to be out and stuck when the worst of the storm hit. 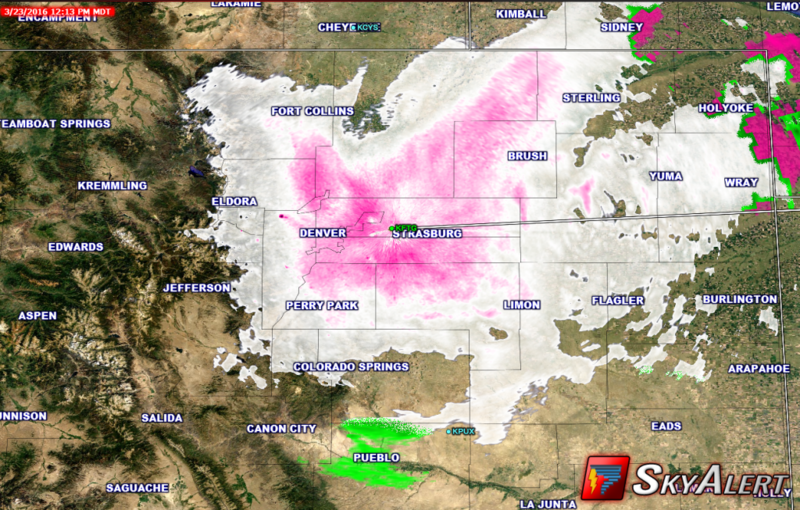 In the end the storm system re-organized over Eastern Colorado and stalled out. This allowed it to wrap moisture around into Colorado and strengthened up slope enough where we saw some intense bands of snow migrating through the area for most of the day. Again, no models picked up on this at all until midnight Wednesday, except the Euro which was forecasting this as early as Monday night. The storm finally began moving out Wednesday evening and off to the Northeast to cause some havoc. It left behind closed roads, stranded cars and snowplows by the boatload in ditches. If you look at the top 25 blizzards in Denver, Colorado history, this one doesn’t even make the top 25 list. The snowfall is not what made this a significant storm, I think that was more the combination of snow and wind. We saw gusts upwards of 50mph through the day yesterday and it was this that caused the roads to deteriorate very quickly. I’m usually my toughest critic when it comes to weather forecasting, but despite the fact that this storm busted way high for snowfall, I think we did a good job communicating the possible impacts. Heavy snowfall, strong winds up to 50mph, hazardous road conditions especially Wednesday morning. 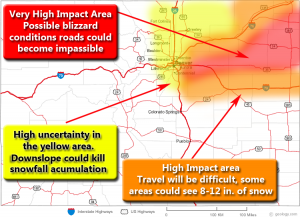 So while the snowfall forecast fell well short, the impacts were certainly there. I give our coverage on this event a B. I think we did a decent job communicating that this storm will make Wednesday very rough. The only tricky part is that by the time we knew snowfall was going to be a bigger issue, my post missed many folks as they were already asleep. Still, I don’t like to start hyping up a storm until I have facts that warrant it. For those of you following along with my clues, you will notice that one model in particular is mentioned in every clue. The Euro model. This model was upgraded recently and in the past some models have really struggled to re-align after a big upgrade. 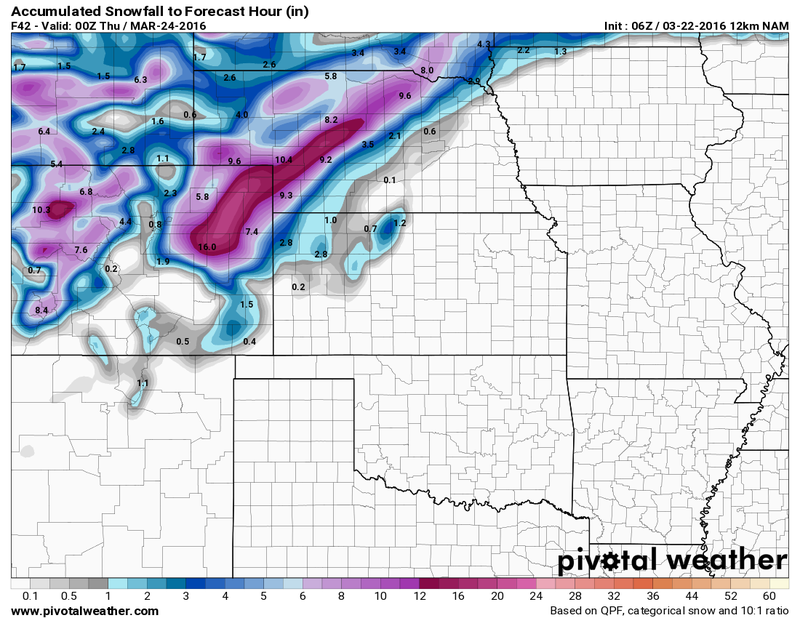 The Euro in this case, was predicting this storm would be significant as early as Monday night. 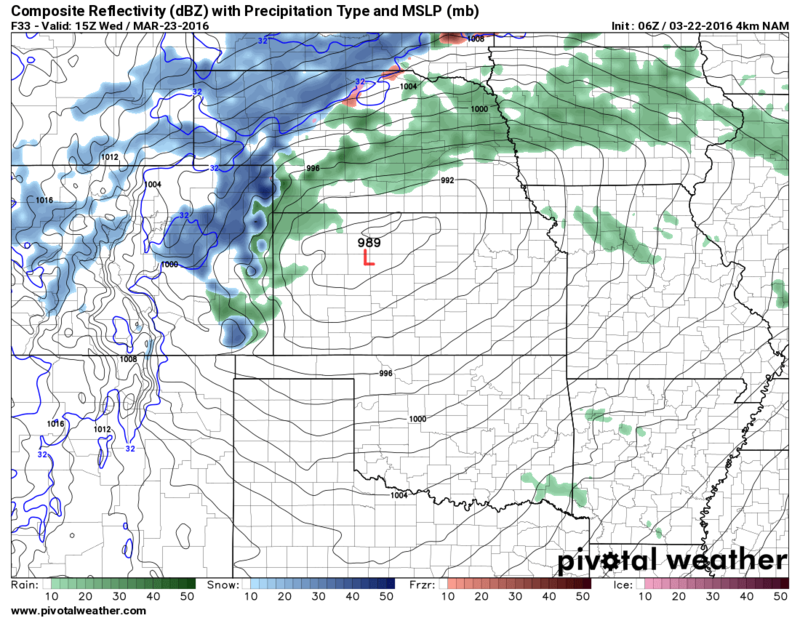 Out of all the models we look at, this was the only one predicting this type of storm. 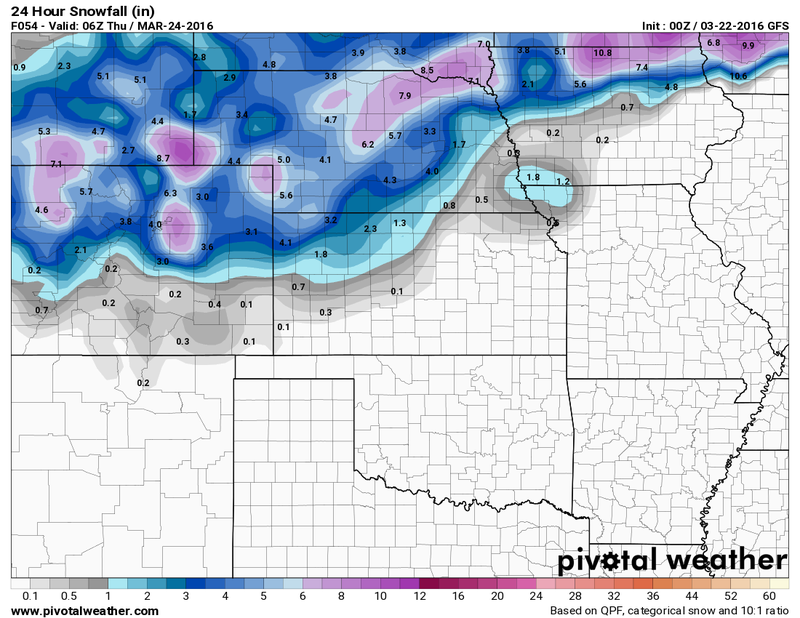 We often call this an outlier and basing your entire forecast on an outlying model can burn you bad! Too many, too little, just right? Would you like to see more or less of something I discuss? 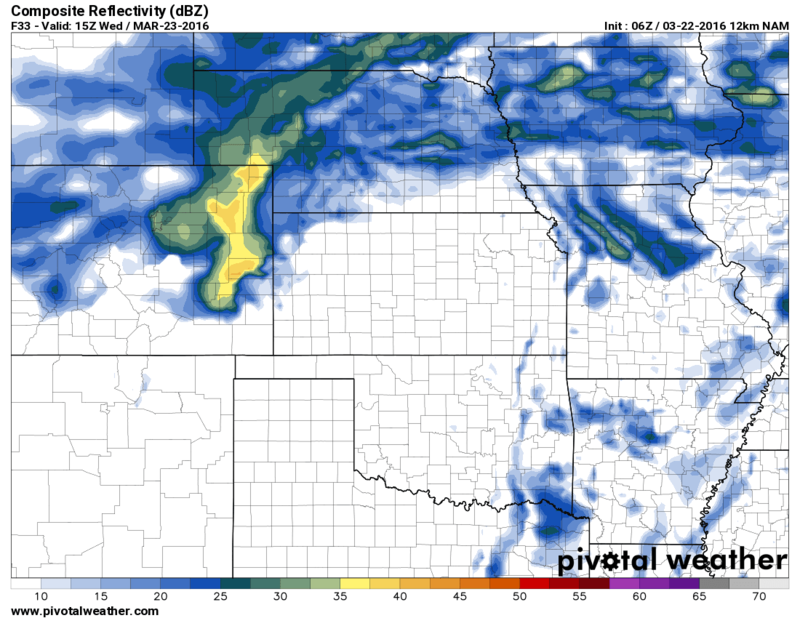 Stay tuned for a post later today about our next storm system, hitting very, very soon!